Borderland is an on going project, a moment of inquiry and awareness about the reality of the “coloured” communities of Cape Town. This project stemmed from the experience of living in the coloured flats of Cape Town in the winter of 2012. Poverty cuts everyone out in a fragile balance between danger and daily life. In the townships, women, men and kids are in contact with gangsters every day, because of their direct involvement to illegal business or just because innocent victims of the frequent shootings between gangs. Synergies between private life and criminal life are shown at several levels. The United Nations Office on Drugs and Crime – UNODC – in its 2010 global report stated that murders are one of the main causes of “unnatural” death in South Africa, giving this Contry the primate of the biggest number of murders in the world. 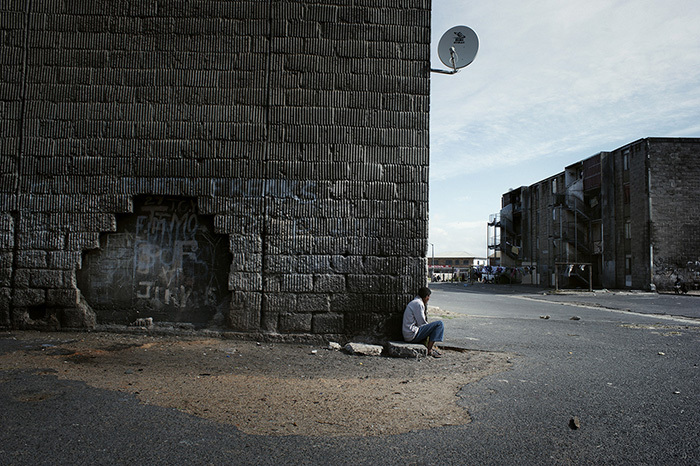 With 41 murders every 100.000 inhabitants, Cape Town holds the biggest number of murders of the entire region, concentrated at the borders of the city, like in the flats areas, where poverty and marginalization are at the base of the criminal activities of the local gangs. The gangs phenomenon is in constant growth, especially the traffic of drugs feeds diffusion and popularity of these illegal orders. The gangs movement is considered as a culture among the coloured communities, a committed ideology, with hierarchies of power and strength internal and external, implicit or evident, often impressed on their own skin, and imperative codes of honour. Breaking any rule of this system could be fatal. With the aim of going more in depth with the research started in 2012, I went back several times to Cape Town to learn, understand and tell the lives of the coloured gangs. After visiting most of cape flats, I have focused my work in areas where the presence of the gangs was stronger, and there I’ve built emotional bonds with people and places. A bond strong enough to feel as a personal cause digging as much as possible into a reality that goes beyond the gangs, but involves everyone living in the coloured areas or close to them.